Algal blooms in northern France, caused by an overabundance of fertilizers. Algae and cyanobacteria (also known as blue-green algae) are microscopic organisms found in nutrient-rich water. In still water, cyanobacteria can form colonies or “pond scum” visible to the naked eye. While most algae are harmless, some cyanobacteria release toxic compounds called cyanotoxins that can be harmful to human health, especially in highly concentrated blooms. 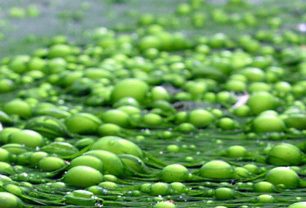 Algae can give drinking-water a musty odor and undesirable taste. Cyanotoxins released by some cyanobacteria can cause allergic reactions, stomach cramps, nausea, headaches, fever, sore throat, muscle and joint pain, oral blisters and liver damage. Continuous sublethal or low-level exposures to cyanotoxins can potentially lead to the development of gastrointestinal, neurological, and liver disorders. Activated carbon is effective, and can resolve taste and odor issues. Reverse osmosis (RO), nanofiltration and ultrafiltration will remove/reduce single-cell cyanobacteria, and possibly the resulting cyanotoxins. Chlorination can kill cyanobacteria but does not filter away cyanotoxins.